Like a lot of gardeners in the North (and South and everywhere else, it seems), my garden has been under constant attack from rabbits this year. 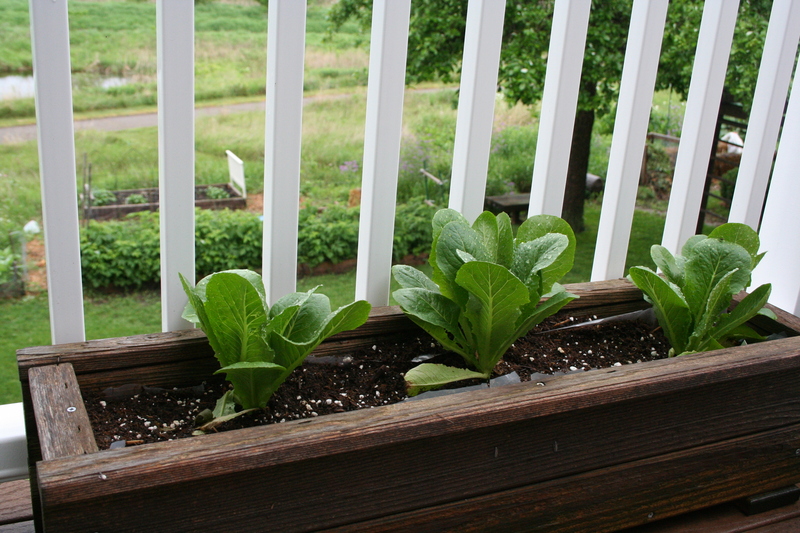 I’m working on some fencing, but in the meantime, I decided to plant lettuce in these window boxes, which are on my back deck. The rabbits are huge, but not big enough to get up the deck steps, and consequently, the lettuce looks great. I bought these boxes on steep discount when a local hardware store went out of business a few years ago, and since then, I’ve been using them to grow annuals. This year, I decided to try greens instead. 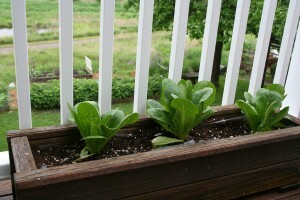 I bought a six-pack of romaine lettuce starts and used a mix of commercial potting soil and compost for the growing medium. We have had plenty of rain since I put them in, so with just a little supplemental watering they have grown really well. Harvest begins in the next few days. To keep the harvest coming, I’ve seeded the pots with another lettuce mix and I will probably buy a few more starts at the local farmers’ market, if I can find them. I’ve written about deck gardening before and it’s consistently been one of my most popular blog posts. 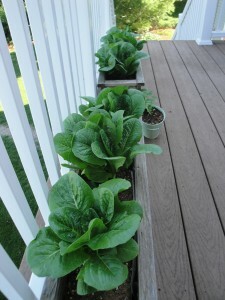 Do you garden on the deck? Flowers or veg? What gorgeous greens you have! Hi Mary! Your greens are amazing!!!! I am trying to grow greens on my own on my apartment deck here in Kampala, Uganda. I had someone make the boxes and they provided soil and baby plants. When they bought the boxes they were full of soil and there is a plastic lining. I am not sure that there are drainage holes though and I don’t’ really notice water seeping out when I water them. I was wondering if your boxes have drainage holes? I have boxes about the same size as yours and was wondering how often do you water them and how much water? I have had the boxes 2 weeks and today the kale and lettuce began to wilt. I had worried about over watering as I noticed some leaves turning brown, so I went to watering 1.75 litres of water per box every 2 days. Now I am wondering if I am over or under watering. The symptoms are the same. The earth about 3 inches down feels moist but not super wet. I don’t’ have access to buy a moisture or PH gage so I am a bit in the dark. Any ideas? You can’t get much lettuce in the stores here and I wanted a fresh and continuous supply of lettuce so I can have my salads hence why I decided to attempt to grow my own!